Magnificent Beachfront Vacation Rentals with Spectacular Views…Just 20 Steps from your own Private Sandy Beach! 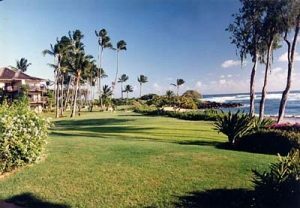 Majestically perched on the Manicured Rolling Grounds of Award-Winning Oceanfront Lae Nani, your residence is ideally located in the Wailua Bay area of the Palm-lined & Plumeria-scented Royal Coconut Coast on the magical “Garden Isle”. These Private & Elegant Condos offer everything for the discerning traveler whom seeks a sense of privacy with oceanfront living, flavored with the most tropical of settings. 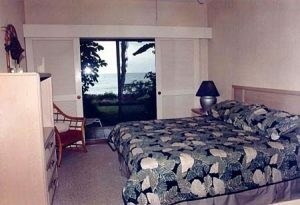 Decorator-furnished showcasing Oceanfront Master Bedrooms, Berber Carpeting, Tiled Double Lanais, TV, VCR & Washer/Dryers. 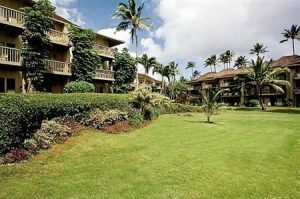 The Low-Rise intimate complex — set amongst Swaying Coconut Palms with lush tropical foliage and expansive Royal Grounds — features a Private Sandy Crescent-shaped beach, Oceanfront Pool, Saltwater Heiau, Tennis, Gas Barbecues and is just a short stroll to shops & restaurants. 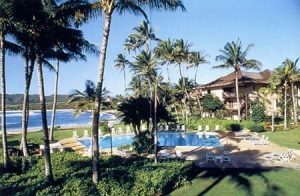 Enjoy Paradise Found from your own Private Beachfront Vacation Condo at stunning Lae Nani… the ideal locale to experience the magical “Garden Isle” of Kauai. These Luxurious 2-Bedroom Beachfront Vacation Condo Rentals – Featuring Oceanfront Master Bedrooms – are approx. 1400 sq. ft. and Accommodate up to 6 Guests. All Linens & Towels Provided.